on lures. 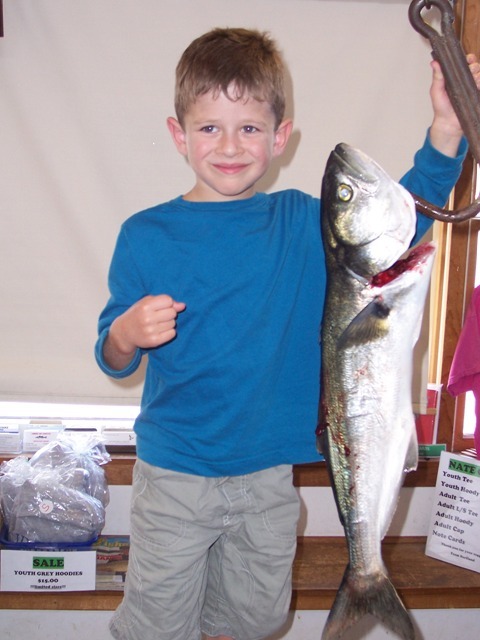 Sam LaPenta was out in the boat with his dad Saturday morning and got this 5-4 pound bluefish on a SP Minnow. Last night the Kelly Boys came to fish. They were here early evening and got their worms and headed to the oceanfront. They called this morning to tell us that they ended up leaving the beach before midnight due to some rainy conditions. Did someone forget the rain gear??? Anyways, they said the got a lot of small stripers with two keepers(just!) before they left. 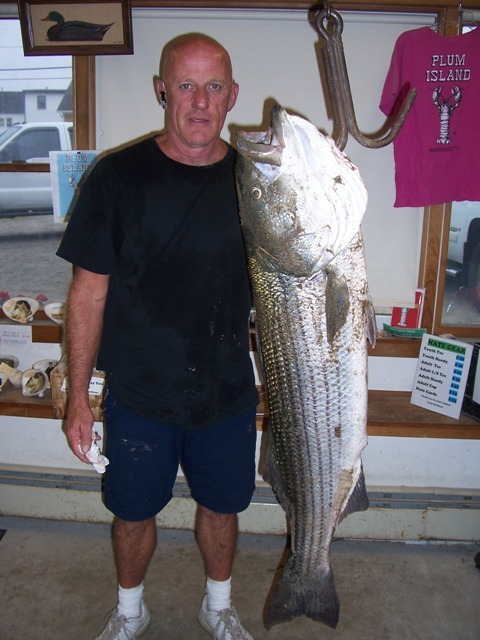 This morning we had Carl Eddy from Dracut in with this 34-4 pounder that he got on clams down at Sandy Point. He was here bright and early and heasded down to the south end of the island. He also said he caught another fish about 31″ and some smaller undersized ones. Some other fishermen were also down at the south end and they only managed small stripers. 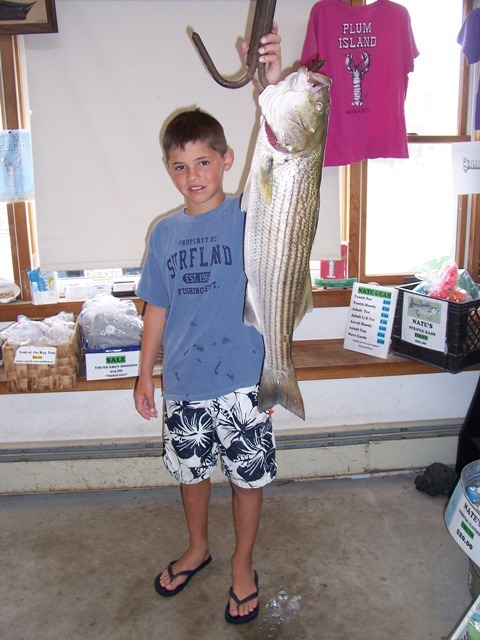 Also in this morning from the boat we had Aidan Connolly from Marshfield with his 11-4 pounder he caught from a boat using the tube-n-worm. And finally, the early birds that were here on the oceanfront, both at the center and down near the refuge got into some blues. They said the blues were in and out for about a quick half hour and then it was over. We have some nice rainy overcast weather today. A good day to fish! The flats were loaded with bluefish Saturday morning – fished the incoming tide from 4 – 7 AM. Lost all my eels to blues – bass are still there by very picky.